Each time you are examined at Vero beach Art of Dentistry, Dr. Johnson Hagood examines the condition of your crowns. Crowns are sometimes replaced for cosmetic reasons and oftentimes to preserve the health of the tooth after the enamel becomes damaged or gum tissue recedes. Many patients come to us for the first time, complaining about the appearance of their old dental restorations. In the case of crowns, an unsightly dark margin may have developed along the gum tissue at the base of the crowns. The dental crowns, themselves, may have become worn or cracked, depending on such variables as eating habits, occlusal forces, and the materials used to make the crown. And, then, there is also the cosmetic context of the crowns. Perhaps, the crown is not a good color match for the surrounding teeth, or the surrounding uncrowned teeth have worn down. Typically, there is more than one thing going on that detracts from the appearance of a smile. A dark crown margin may initiate the question, “Doc, what can be done?” And, of course, there is a solution. 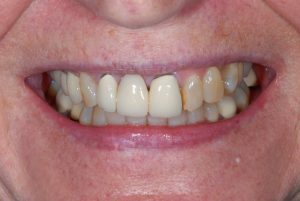 A new replacement crown can be designed with a more perfect fit for the gum line. Patients are often surprised to learn how today’s dental ceramics have greatly improved the fit of crowns and also how perfectly porcelain matches the enamel of a pristine, healthy tooth enamel. If gum tissue becomes inflamed and recedes, this contributes to a dark margin. Worse yet, if dental decay develops at the margins of a crown, it can rapidly advance under the crown, destroying the supporting structure of the crown. In some circumstances, a new crown can be used after removal of decay. In other cases, the most predictably successful treatment will be removal of the decayed tooth and replacement with a dental bridge or implant crown. If you are you concerned about your crowns or other dental restorations, we welcome you to give us a call and schedule your special time with Dr. Hagood. A careful examination in our office will determine the current condition of your teeth and dental restorations. You will be informed about what is possible to conservatively restore your smile and achieve your cosmetic goals. Call our office to learn about the consultation appointment that is best for your circumstances and goals. Patients learn priceless information about their oral health, smile appearance, and the path forward to the confident smile they crave when they come in for a consultation that includes The Trial Smile. « What do patients appreciate most about Dr. Hagood?